Is Your Garden Ready? 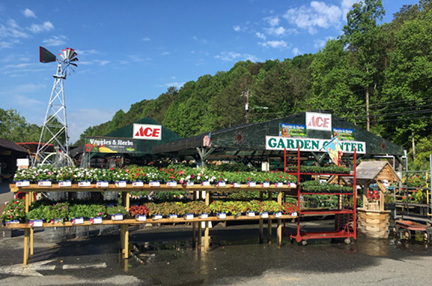 ACE Hardware in Ellijay is Here to Help You Get Any Type of Garden in Tip Top Shape. There are gardens and there are gardens: vegetable and flower gardens, some done organically. There are large and small gardens; patio gardens, and container gardens. Everything you’ll need to start can be found at ACE Hardware in Ellijay. They supply everything from tools, to soil preparation, to plants, landscape materials, and even advice. For 20 years, Bob Wright has operated the Garden Center at ACE and he’s there to help gardeners of all levels. He knows his business— and his products— and can make experience backed recommendations based on your needs. Wright suggests starting with a soil test, which can be done at your local University’s Cooperative Extension. Once you’ve determined the condition, you can prepare the soil as needed. ACE carries a wide variety of fertilizers, compost and soil conditioners for any use. While top soil is a good filler, Wright does not recommend that it be used on it’s own. Nature’s Helper Soil Conditioner is good for trees, and shrubs (advice ½ bag per fruit tree). For the smallest of gardens in pots, he suggests that you use potting soil, along with Miracle Grow Moisture control. Trees love mushroom compost. For Organic compost, use one cubic foot per tree. Peat moss is nothing short of a gift for the organic gardener and landscaper. It has amazing water-retention abilities, easily retaining more than 10 times its weight in moisture, and also keeps in essential nutrients. ACE Hardware carries local distributor’s fruit trees: eight varieties of apple, four of peach, Bruce plum, and Bartlett pear. Wright says that the fruit trees usually sell out, so get yours early. There’s a large selection of annuals and perennials including herbs, vegetables, shrubs, bedding plants, hanging baskets—and one of Bob Wright’s favorites—“toe-ticklers,” plants that are fill-ins between paving stones such as creeping Jenny and creeping Thyme. He also is partial to Coral Bells, Heuchera sanguinea, a perennial plant that lasts through winter and comes in a variety of foliage colors. Wright also suggests using three inches of mulch to keep in moisture and protect roots. ACE Hardware carries Cypress mulch, Pine bark mulch/ nuggets, Red bark mulch/nuggets; one is not considered better than the other, it’s simply up to your design preference. He adds that any colored mulch should hold its color about two years. Whatever your gardening needs, ACE Hardware is there to help.